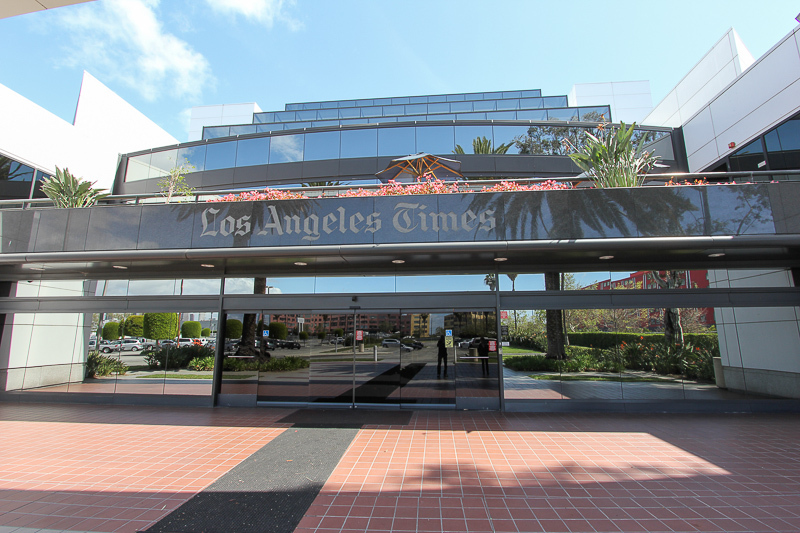 March 26, 2014 - Today's adventure brought us to downtown Los Angeles to tour both the editorial offices of the Los Angeles Times, located at 1st and Spring streets, and the LA Times Olympic Printing Plant at 8th and Alameda. 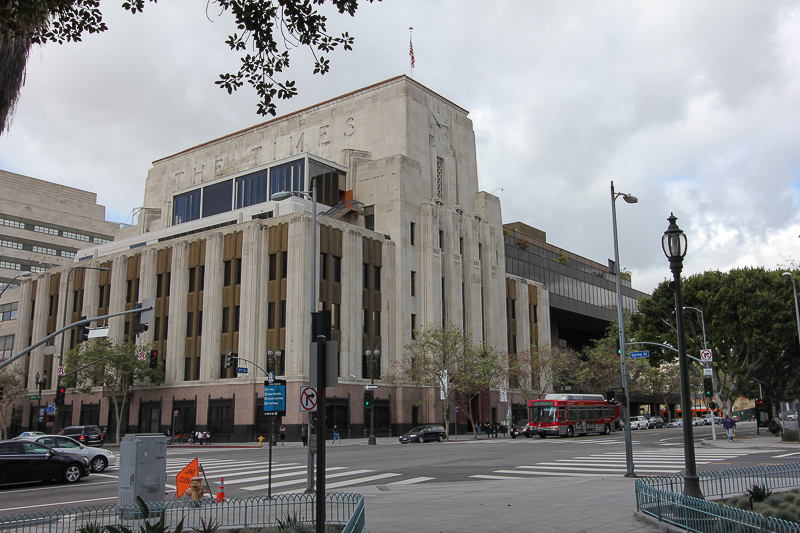 The Times Building, which opened in 1935, was designed by Gordon B. Kaufmann, whose other works include the Hoover Dam, Santa Anita Park and the Athenaeum at the California Institute of Technology. The Globe Lobby is one of the aesthetic highlights of the Times Building. 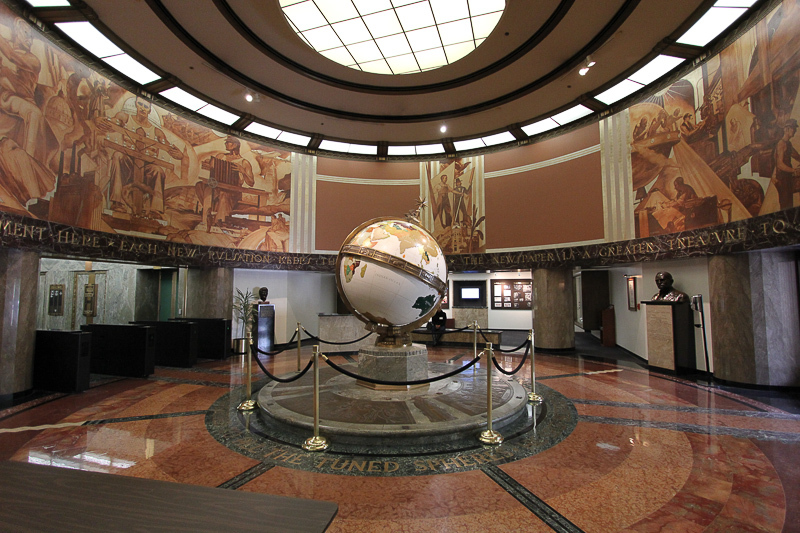 Its 10-foot-high murals were painted in 1934 by Hugo Ballin, who also painted the Griffith Observatory rotunda. 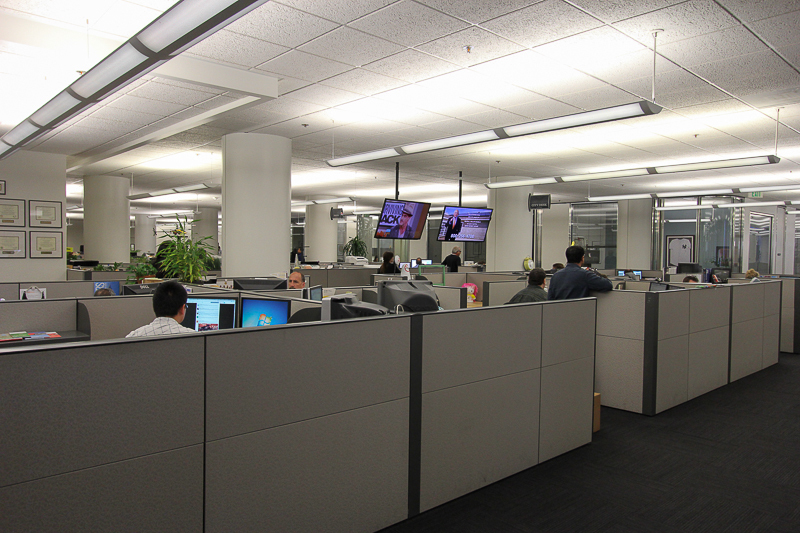 The Los Angeles Times was first published on December 4, 1881, under the name of the Los Angeles Daily Times. 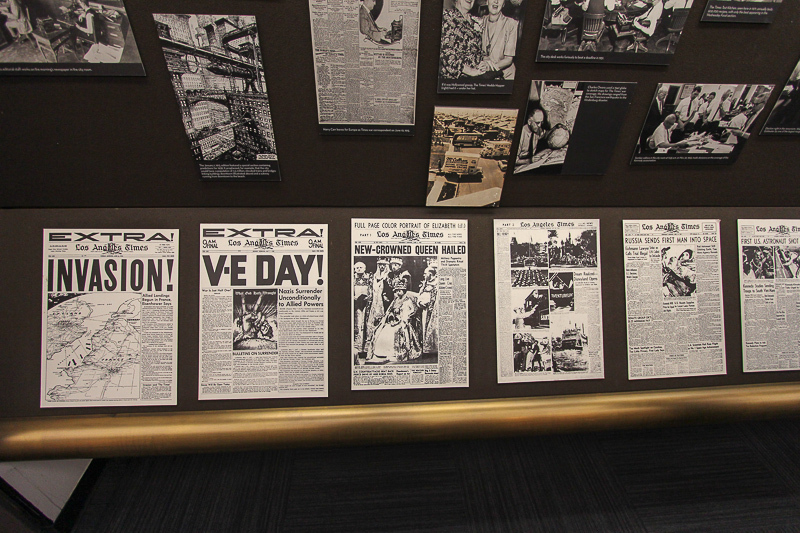 Some of its more memorable front pages are displayed off the lobby. We are fortunate to know Jeff Gottlieb, whose efforts, along with those of Ruben Vives, resulted in the 2011 Pulitzer Prize for Public Service. The Pulitzer Prize for Public Service is one of the fourteen American Pulitzer Prizes annually awarded for journalism. It recognizes a distinguished example of meritorious public service by a newspaper or news site and is the only prize in the program that awards a gold medal and is therefore the most prestigious one for a newspaper to win. 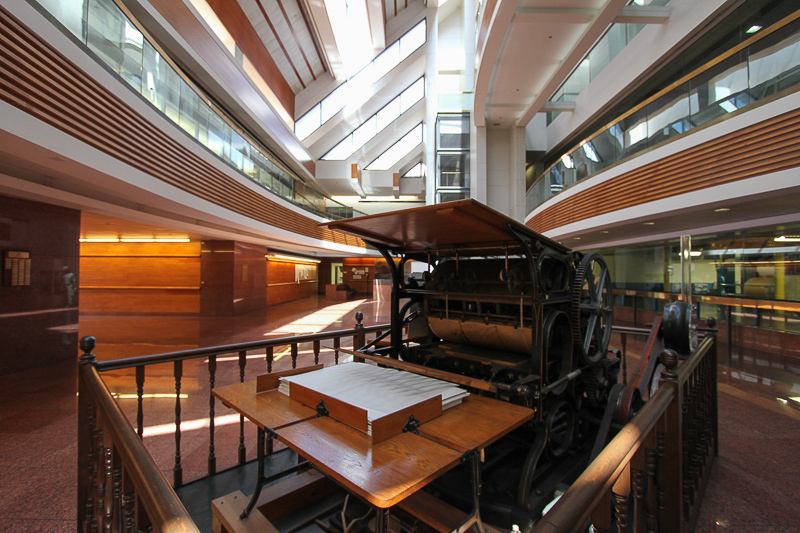 Since 1942, the Times has won 41 Pulitzer Prizes, six of which are gold medals for public service. Through Jeff and Ruben's efforts, everyone in America came to learn about the corruption in the city of Bell, CA. We didn't get to see Jeff today, but we were lucky enough to be introduced to Ruben. 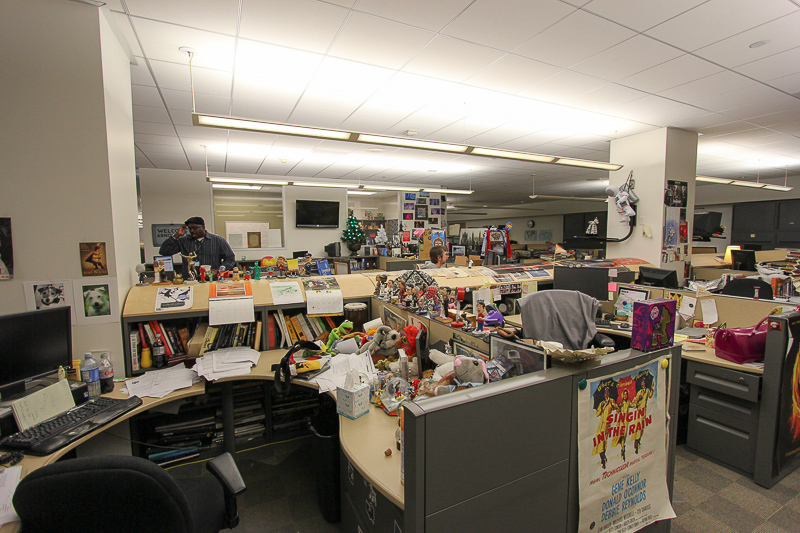 The work areas of the news department are fairly low key and are a lot less hectic than the scenes portrayed in Hollywood movies. 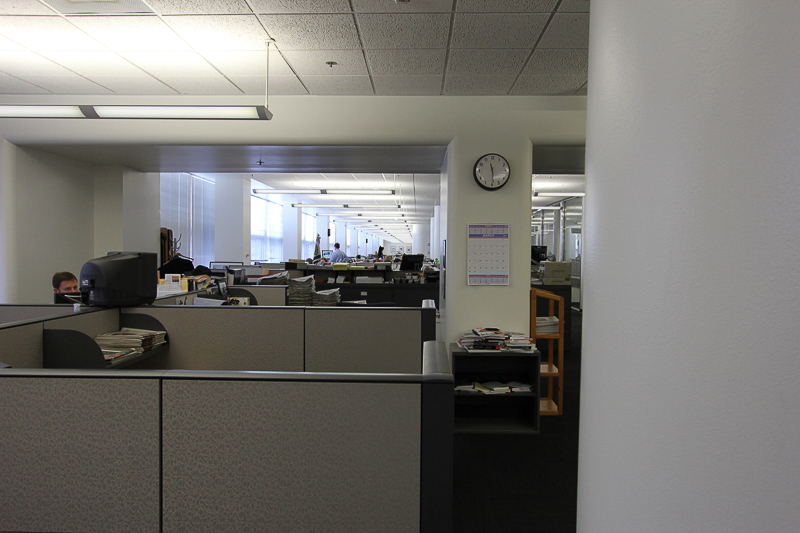 We were astounded by the amount of office space occupied by the Times staff. This picture has a lot going on in it. 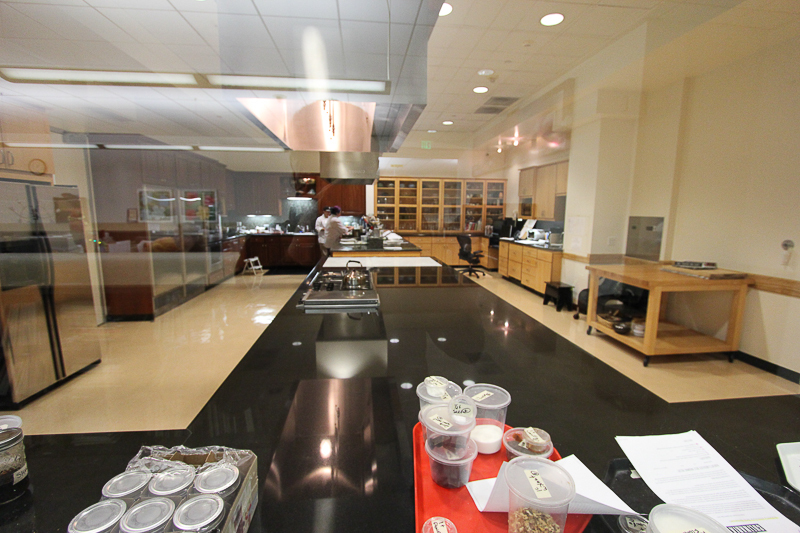 We're standing in front of the LA Times "Test Kitchen" and our tour guide, Darrell Kunitomi, is standing in the center of the picture. One of the Times staffers is almost buried by the books submitted to the Times for review. The amount of books, movies, games, and music CD's that are received daily (hopefully to be accepted and reviewed in the paper) is staggering. Also in our tour group was a grandson and the great-grandchildren of the actress Barbara Billingsley, who portrayed June Cleaver in the "Leave it to Beaver" television show. Yes, they really do test recipes before their publication. In addition to their archived scanned images of the publication, they also have many of their older pages available on microfilm. Way back in the pre-digital age, clippings of each story were cut from the paper, stored and indexed for future retrieval. 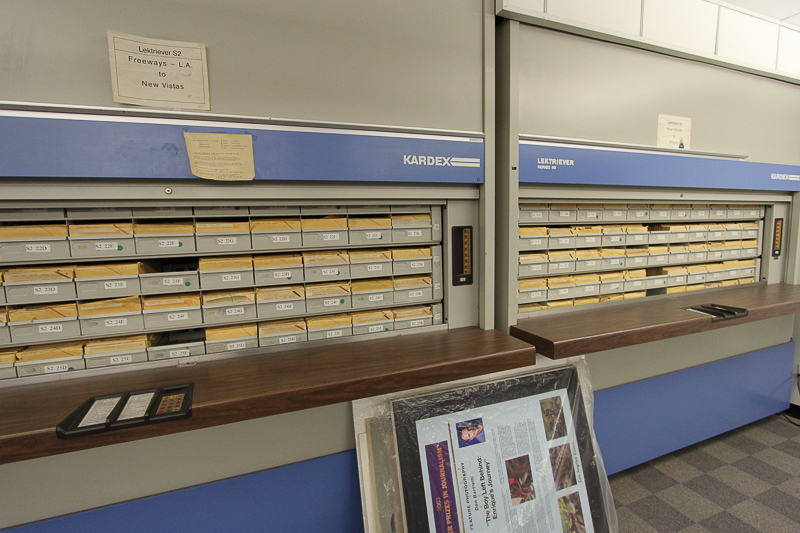 The Times still has all of those clippings in manila envelopes and this Kardex system rotates to bring the desired indexed tier of envelopes into view. One of our last stops on the first tour was to the entertainment division, which was a little more lively than the news room upstairs. Before leaving the building we happened to glance Janet Napolitano (former Secretary of Homeland Security and current president of the University of California system), who was being interviewed in a conference room by Times staff. The second part of our tour started a couple of hours after we left the editorial offices. 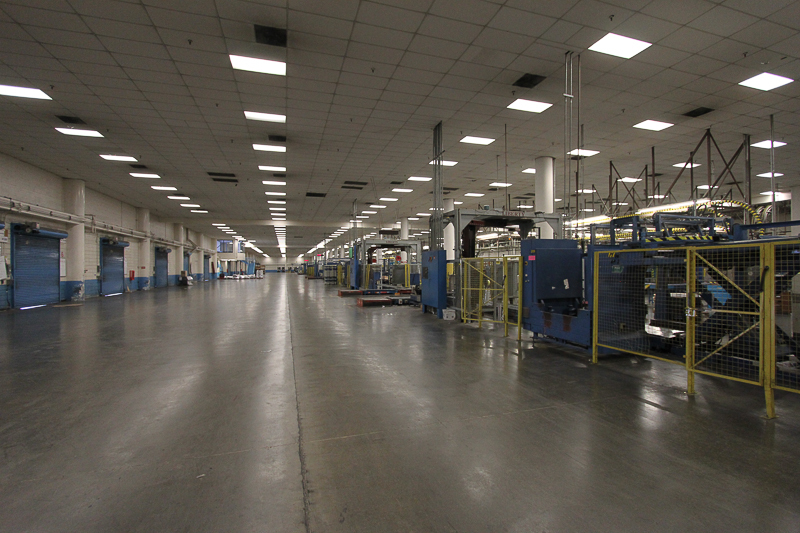 The Olympic Printing Plant is huge, occupying about 685,000 square feet of space. The Olympic lobby is certainly expansive compared to the smaller Globe lobby downtown. However, the detail and the workmanship of the Globe lobby continues making it an architectural gem. 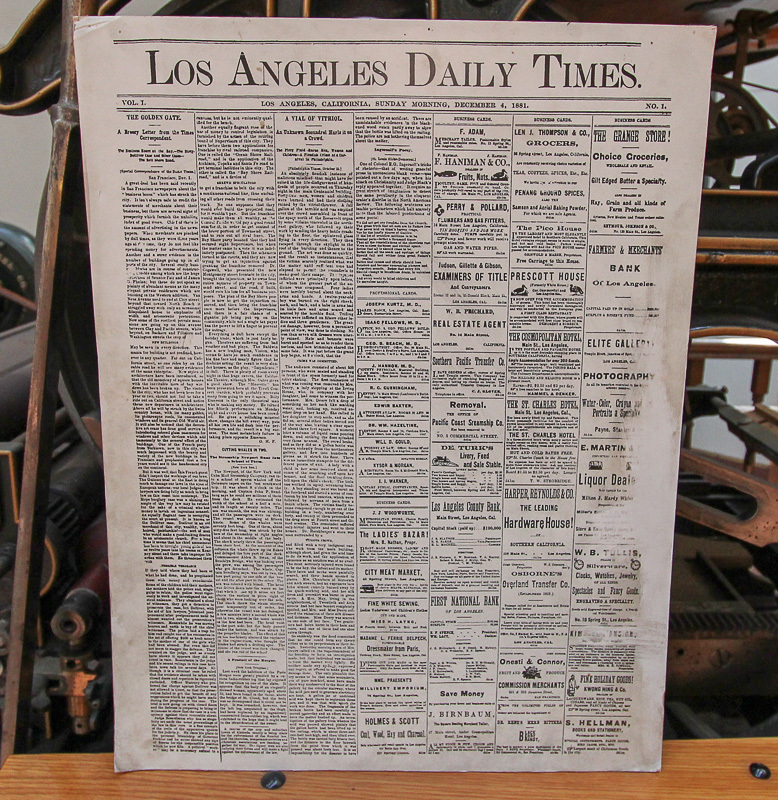 This is a copy of the first edition of the Los Angeles Daily Times. The only known original copy (Volume 1, Number 1) is in the Huntington Library in San Marino, CA. 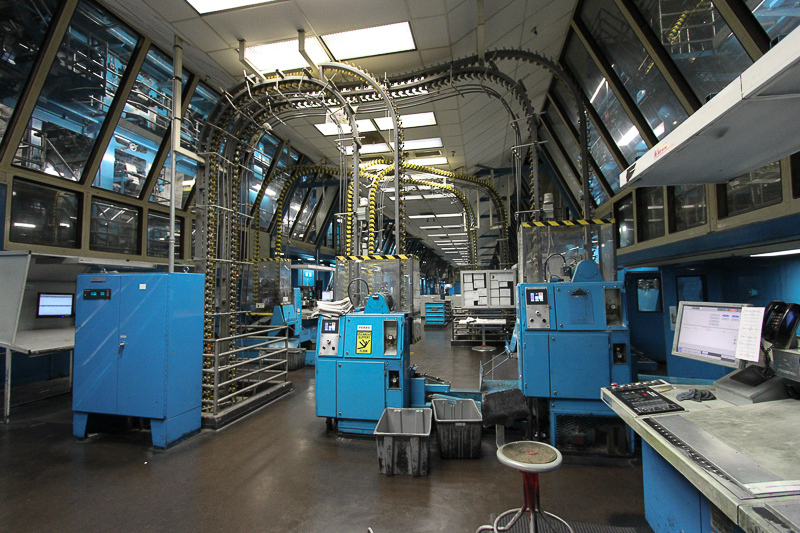 There are two different technologies on view at the printing plant: high-tech and low-tech. 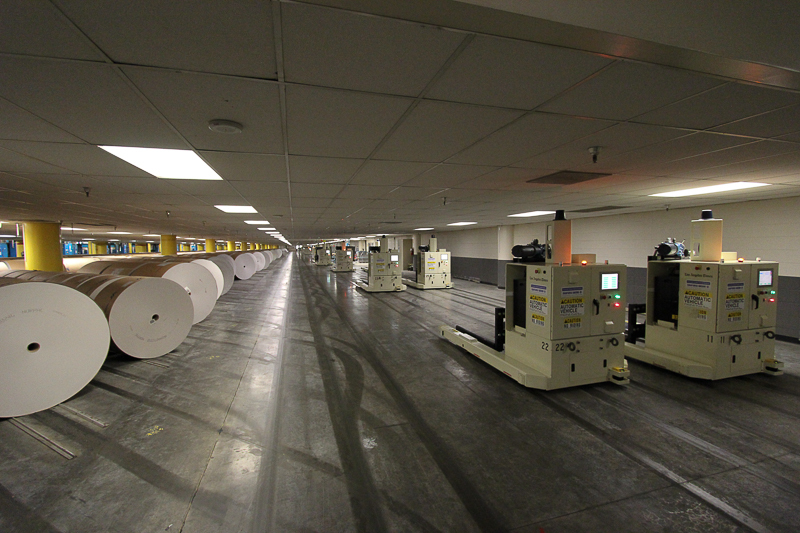 An example of high-tech is seen in these robots that lift and place these enormous rolls of newsprint within the printing presses. The robots are laser guided, so each one moves on its own to its appointed destination. 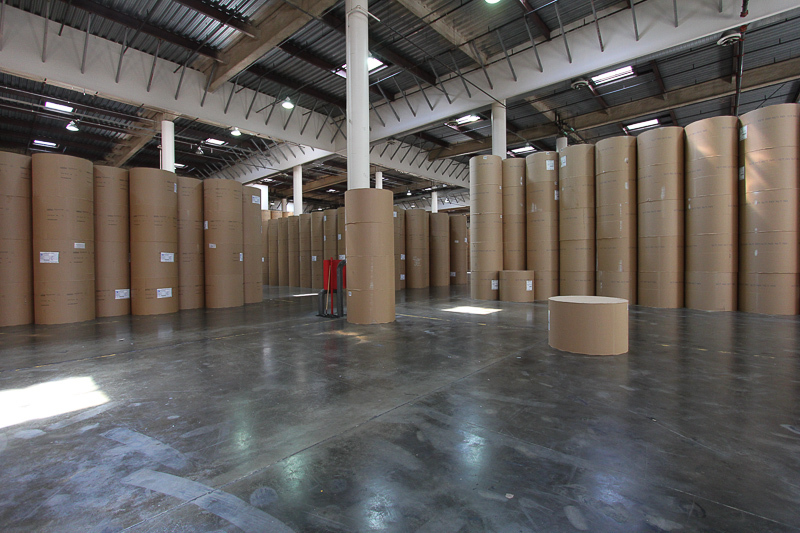 Each roll of newsprint weighs about one ton (2,000 pounds) and unrolled is about eight miles long! The paper is directly delivered to the plant in railroad box cars. 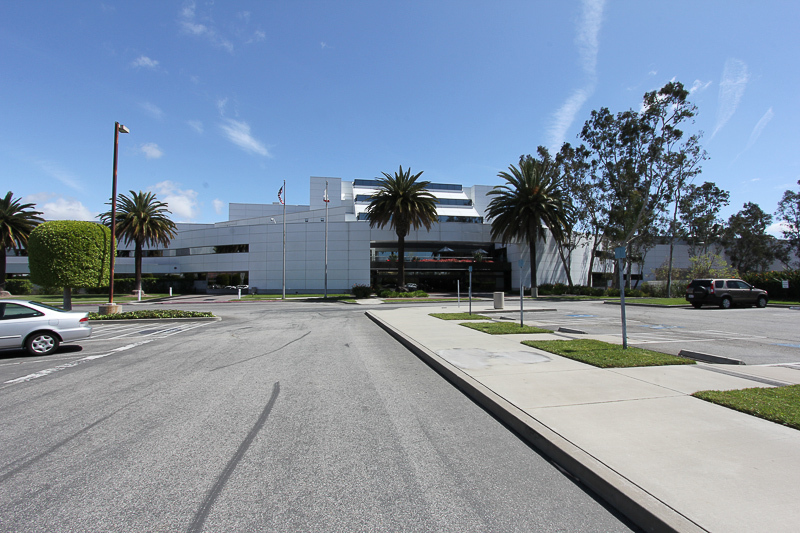 This facility can accommodate eight box cars inside the building! 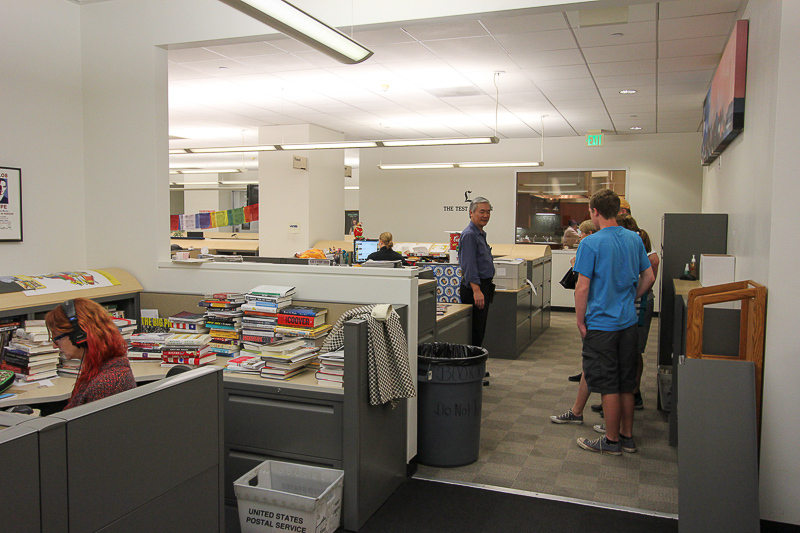 The press room is three stories high and occupies 57,000 square feet. The presses run at night so we didn't see them in operation but Darrell told us that the noise level was pretty high when they are running. 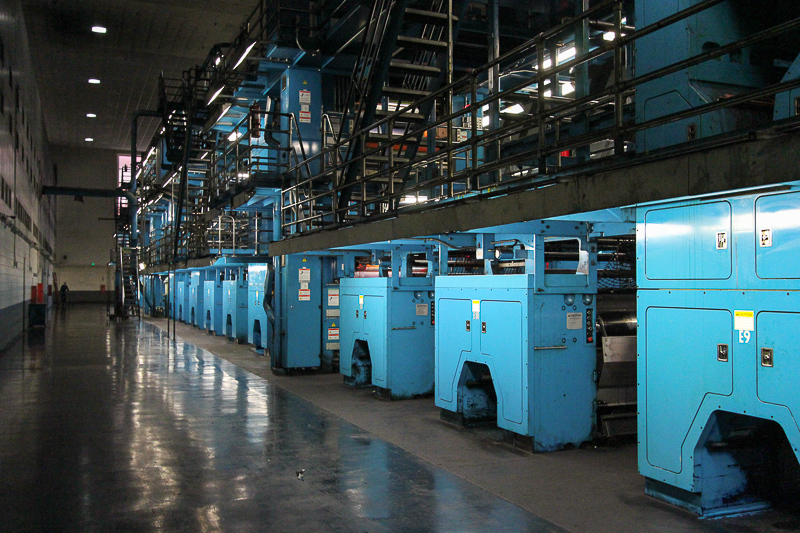 We were able to walk in and around these massive presses. 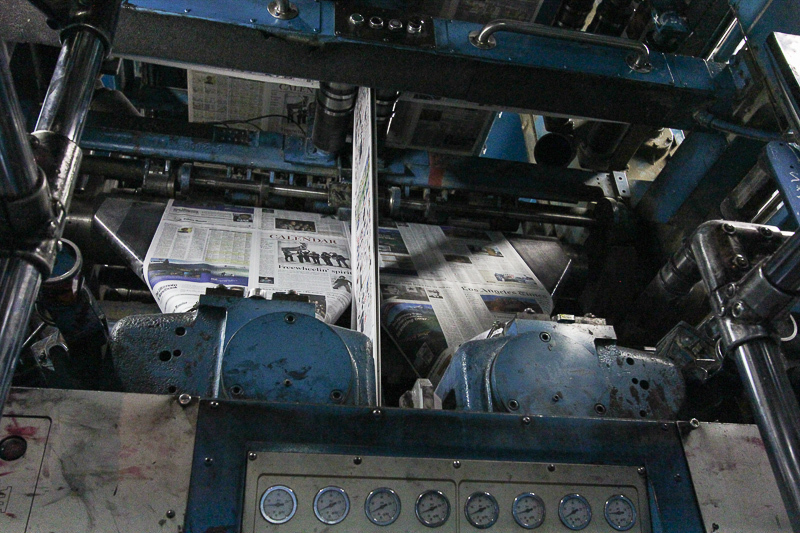 This photo shows one of the machines that folds the printed pages. This is the low-tech side of the operation. Since there's a lot of ink everywhere, all of these machines have to be manually cleaned every day. 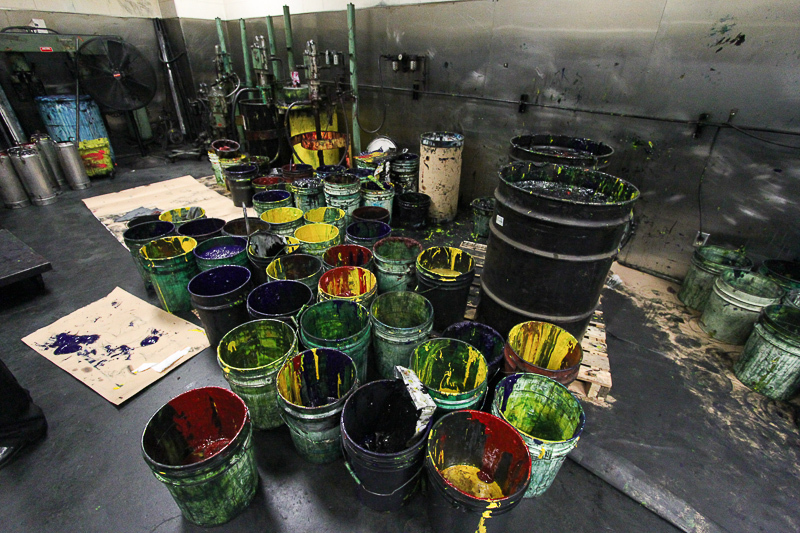 The result is buckets of excess ink that is gathered and then recycled. Once the papers are printed, folded and assembled into sections, they are then bundled for distribution. 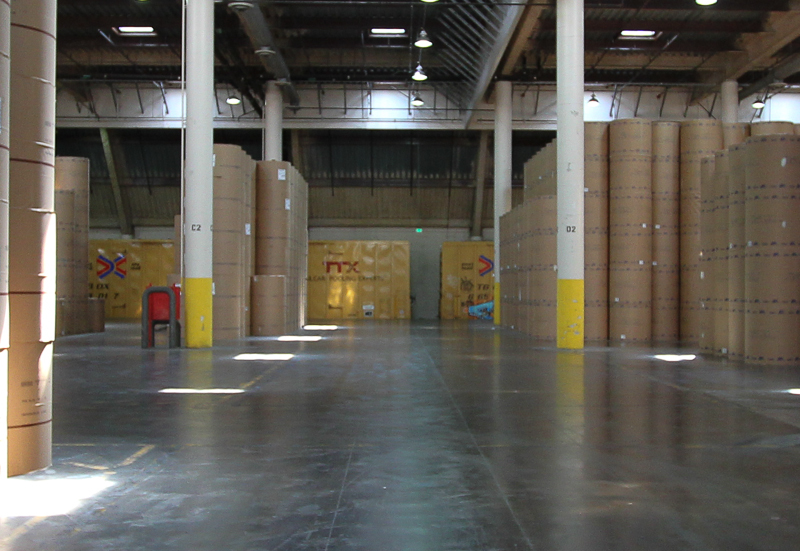 The bundling machines are to the right and the truck docks are to the left. Since we learned of a few administrative clues that are buried in each printed page, we will probably never read the Times the same way that we have in the past. It was a very interesting and educational day. To fuel ourselves for our four-hour adventure, we had "brunch" at Philippe's before we started at 11:00 AM. 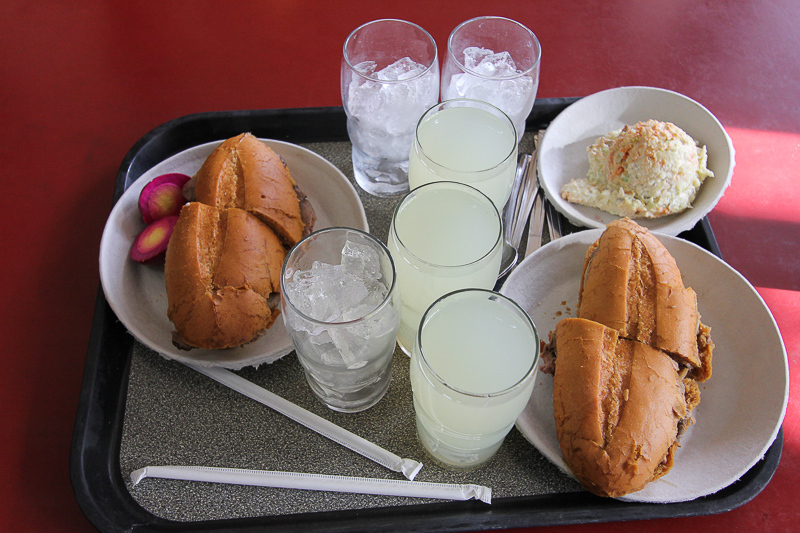 Two beef "double dipped" sandwiches, one pickled egg, potato salad and three fresh lemonades kept us going until 3:00 PM.